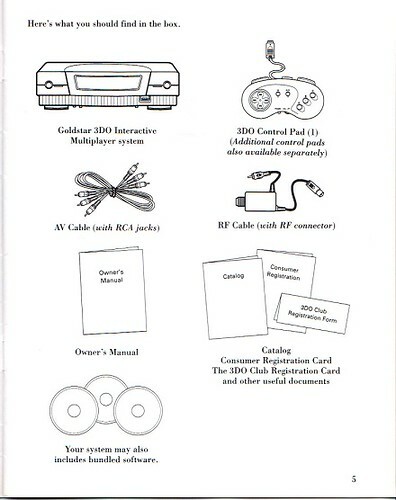 Contents of a complete Goldstar 3DO package? I should be receiving a boxed Goldstar system in the mail within the next week or so! I am curious--what came with the system originally? Any bundled games, any demos, and so on? I would like to try to eventuallly make it as "complete" as I can get it. At least, pack-in games and an instruction manual. My first 3DO was a Goldstar way-back-when, and I recall it having the usual stuff (box, styro, manual), but the person I got it from also included a black sleeve that housed to jewel cases. Was this something that originally came with these? I haven't seen those since. PS, anyone have a spare Goldstar manual? The Goldstar is the only one I still have the box for (because it was up high as I didn't care to much for it). I don't recall a black sleeve. I know one of the games was FIFA I'm pretty sure the other was Shockwave. I can't get to my box right now but it probably says on the outside of it. The FIFA was a longbox manual with a black and white cover. I don't know if the regular one was in color or not. I think Shockwave's manual was a booklet that fit into the jewel case. 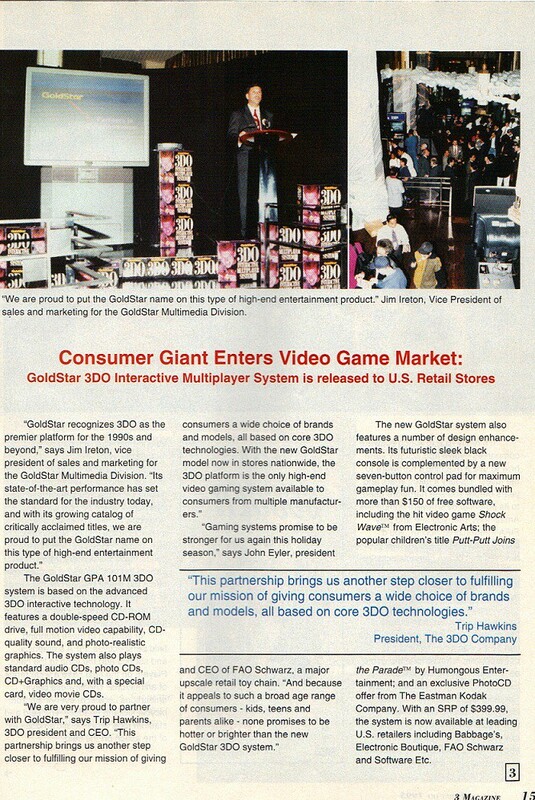 OK, that makes sense because when I got my first Goldstar used in the '90s, Fifa and Shockwave came with it (along with Street Fighter, Gex and Bladeforce, but the person must have bought those separate). I don't remember--are the Fifa and Shockwave Not-For-Resale versions? I found another longbox version that has the same disc of the second auction listed. Soooo, it looks like they used multiple disc labels for various runs of the longbox Fifa. So much for hoping that would solve that question, ha.. Here is a pic of one of my new/unused Goldstar units. The black sleeve houses Fifa and Shockwave. I'm almost certain the Goldstar unit had a photo cd included in its initial bundle. Not quite sure why (maybe I read it somewhere) but I think one of the Putt Putt titles might have been included also. Trev wrote: I'm almost certain the Goldstar unit had a photo cd included in its initial bundle. Hmmm... I'm not sure I've ever seen a Goldstar unit with the photo CD, but I could very well be wrong. There were quite a few different model Goldstar units and it is possible one of them came with the photo CD I suppose. Trev wrote: Not quite sure why (maybe I read it somewhere) but I think one of the Putt Putt titles might have been included also. Something about this sounds familiar to me too, but I can't quite place it. Awesome!! Thanks, Bitrate, that clears things up a bit. So the black sleeve I had way-back-when did indeed come with that Goldstar unit. Those Not For Resale stickers on the games--are those on the cases themselves as far as you can tell, or on top of the shrink wrap? I know I am getting overly picky at this point, but I am curious anyway. Austin wrote: Awesome!! Thanks, Bitrate, that clears things up a bit. So the black sleeve I had way-back-when did indeed come with that Goldstar unit. Those Not For Resale stickers on the games--are those on the cases themselves as far as you can tell, or on top of the shrink wrap? I know I am getting overly picky at this point, but I am curious anyway. The "Not For Resale" stickers are attached to the jewel cases, not the shrink wrap. Here is a picture from an auction that just ended. It looks as though the seller was selling the system with its original two pack-in games as both of them have the "Not For Resale" stickers. That must be what I am remembering. I don't think I have ever seen a 3DO Goldstar box with Putt-Putt being advertised as a pack-in. I wonder if they decided against that idea and went with Fifa. Or, perhaps Putt-Putt was handed to every customer who purchased a new Goldstar unit at the time. I kind of doubt it, though. Concerning the photo CD, I'm pretty sure that I have never seen one bundled with a Goldstar system. In fact, the article makes it sound as though, if it even happened, it was some sort of mail-in promotion. Yup, same as mine. The black sleeve must have been lost over the years. 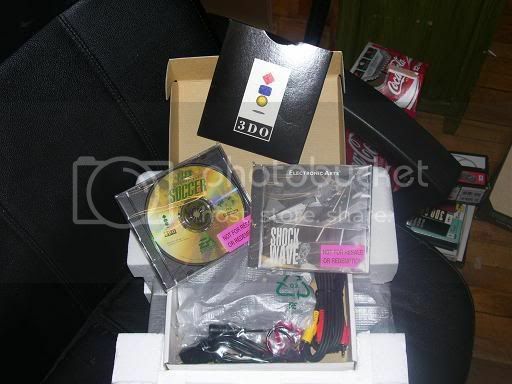 bitrate wrote: I don't think I have ever seen a 3DO Goldstar box with Putt-Putt being advertised as a pack-in. I wonder if they decided against that idea and went with Fifa. Or, perhaps Putt-Putt was handed to every customer who purchased a new Goldstar unit at the time. I kind of doubt it, though. I received my system in the mail today, and guess what? It advertises Putt Putt, Shock Wave, and the Photo CD as pack-ins! Unfortunately, since there was no documentation with it, I can't tell if, say, the photo CD disc was some kind of promotional mail-in. I can get a picture of it and post it here later tonight. I'd like to see a pic of it ... I've been curious since you first posted this thread. Austin wrote: I received my system in the mail today, and guess what? 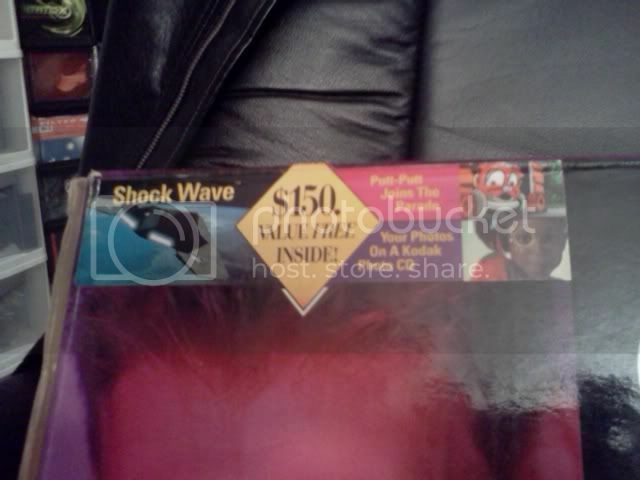 It advertises Putt Putt, Shock Wave, and the Photo CD as pack-ins! Unfortunately, since there was no documentation with it, I can't tell if, say, the photo CD disc was some kind of promotional mail-in. Absolutely. I am interested in seeing that. 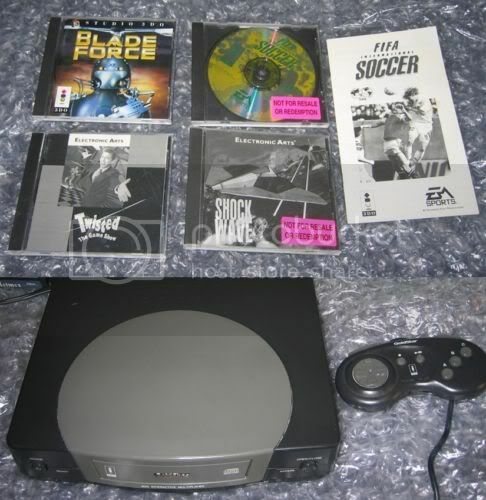 Re: Contents of a complete Goldstar 3DO package? Austin wrote: PS, anyone have a spare Goldstar manual? Shoot me a pm if you still want one. It's funny. I don't think that I have ever seen a boxed Goldstar set that included the Photo CD. People who bought the Goldstar 3DO must have thrown out the disk right away. I've seen plenty of Panasonics with the Photo CD though. Looking through photos of my past collection, I found that this box is different from the one I used to own. Something I never really noticed before (there being multiple types of the Goldstar box). 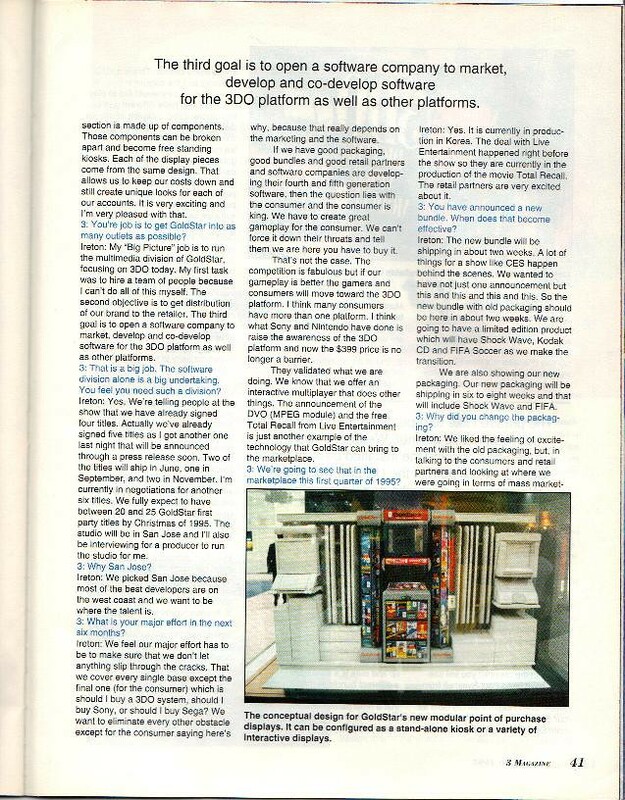 Scanned another article which may be of interest ... a limited edition transition bundle?